The Mad River Valley in Vermont is an endlessly interesting community. I have lived here for 40 years now and never ceased to be surprised by the ingenuity, creativity and generosity that abounds, especially in crisis. We learned the hard way about vengeful weather when hurricane Irene ripped through our towns, and while we lucked out on Sandy’s rage, we do understand what it is like to recover from such trauma. We saw it on a micro scale by the numbers, but then Vermont is not a numbers state. One person to another we all got what this means to the people on the coast. We have lent our power repair guys in their trucks, and the phone company sent theirs as well. For the rest of us normal people though we do what we can. The network started humming and suddenly we were given a truck and driver from LandAir Express in Burlington. Someone figured out a method to handle distribution when the truck arrives on Staten Island, which we learned the hard way is a serious issue. Telecom, our local ISP among other things has offered to bring a dumpster full of cardboard boxes to the site where locals can sort by size and then pack up all of the things that we have learned will be needed. It is a short list of things that we are allowed to send for distribution, but valley wide you can hear washers and dryers running with people emptying closets and getting ready to pack the south bound truck on Tuesday. This is one thing going on, but the truth is that in Vermont, filled as it is with independent minded people, groups are forming to tackle all the facets of this recovery. I know of at least a dozen different approaches to assistance, all of them important and everyone bringing whatever resources and skills they have into play. 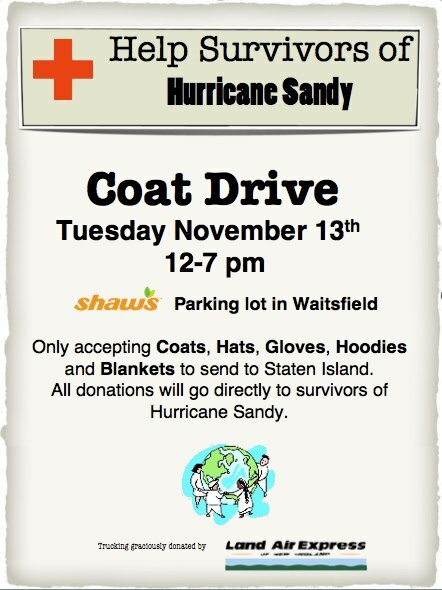 For me, the party is on Tuesday at our local Shaws but I have learned that the need for assistance will last for months. We need to develop regular deployments of people and property to the area until everyone is once again safe and warm. Please let me know if you have a good idea and need help implementing it. You can post your thoughts and ideas here http://www.facebook.com/WelcomeToTheValley which is a community of local and out of state people interested in participating in all things going on around here. Together we can really make a dent in the damage done.